Facing a daunting fiscal gap, Governor Charlie Baker on Wednesday proposed a $38.1 billion annual state budget that reins in spending for a vast array of programs, including health care for the poor and disabled as well as state employees. A few select priorities — such as higher education and aid to cities and towns — would be increased. Sticking to a campaign pledge, the budget includes no new taxes or fees. It comes weeks after Baker and the Legislature scrambled to close a $768 million gap for the current fiscal year, through cuts and other measures. 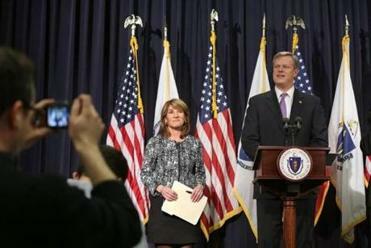 Many of those cuts will not be reversed in the new fiscal year, Baker aides said. Overall, spending for the fiscal year that begins July 1 would rise by $1.1 billion, or 3 percent, less than half the rate the budget is projected to grow this year, officials said. Governor Charlie Baker’s first budget proposal is all about the deficit. “By right-sizing the budget now, we are making Massachusetts a better place to live and work today and into the future,” Baker said at a State House news conference. The unveiling of the budget, always a major event, was even more closely watched this year because it was the first such proposal from Baker, a Republican who took over in January after eight years of Democratic rule. Despite the warnings of dire fiscal times, many advocacy groups praised Baker for maintaining key services. Still, others were not happy. The chief justice of the state’s highest court, Ralph D. Gants, estimated that Baker’s budget would force the court system to eliminate 550 employees. “This proposed budget does not provide the necessary funding for us to operate or staff the courts in a safe and effective manner. Nor is it fair,” Gants said in a joint statement with other court officials. Baker administration officials said that the budget allots the judiciary essentially the same amount of money it is getting this fiscal year. A court spokeswoman later said that the system would need a lot more money just to maintain its current level of employees. The level of funding offered by Baker for the Trial Court “would force a more drastic curtailment of the delivery of justice in Massachusetts than the state has ever experienced,” Trial Court administrator Harry Spence said. Public employee unions decried Baker’s plan to increase health insurance premiums for state workers hired before 2003 from 20 percent to 25 percent. Those hired after 2003 already pay 25 percent. David J. Holway, national president of the National Association of Government Employees, said the cost of a family plan for certain state workers would increase from $6,179 to $7,698. “Shifting these additional costs onto the backs of state workers who have sacrificed greatly, and given back consistently throughout the fiscal crisis, is not the answer,” he wrote in a letter to House leaders. Baker aides said state employees would still have more generous health plans than most workers in the private sector and in many states. Baker aides said some tough choices were necessary because Massachusetts is facing a $1.8 billion shortfall next fiscal year, due to ballooning costs, as well as a past reliance on sources of money difficult or impossible to tap again, such as casino licensing fees. The administration had previously announced increases in aid to cities and towns, public schools, the MBTA, and the beleaguered Department of Children and Families. Baker’s budget also includes an average 3 percent increase in funding for state universities and community colleges, although officials are not yet sure whether that will be enough to freeze student costs. The biggest program Baker targeted was Medicaid, the state-federal health plan for poor and disabled people, which has been increasing at a high rate in recent years. Administration officials said that, if no changes were made, spending on the program would increase by 16 percent next year. Baker’s budget would pare that increase to 5.6 percent. Baker aides did not fully detail how those savings would be achieved. But they said about $200 million would be saved by requiring people to reenroll in the program, as the law requires, weeding out those who are not eligible. Baker also endorsed the bulk purchasing of medical equipment and a move to shorter-term drug prescriptions to prevent waste and abuse. Officials said they are not cutting the rates medical providers are paid, nor changing Medicaid eligibility requirements or benefits — except for one. Chiropractic care will be eliminated, saving Massachusetts about $300,000. Health Care For All, an advocacy group, praised Baker for protecting Medicaid coverage for dental benefits, such as dentures, that were cut in 2010 and only recently restored. Baker’s budget “maintains the Commonwealth’s longstanding commitment to providing access to affordable health care,” said Amy Whitcomb Slemmer, executive director of Health Care for All. Eileen McAnneny, president of the business-backed Massachusetts Taxpayers Foundation, said the budget is a “great first step” in slowing the growth in state spending. “They did it in a way that was responsible, all things considered,” she said. But Noah Berger, president of the liberal-leaning Massachusetts Budget and Policy Center, said Baker’s budget falls short of noble goals. He said the budget would not whittle the waiting list for prekindergarten programs, would not reduce the cost of higher education, and would do little to tackle the multibillion-dollar problems facing the state’s transit system. “The priorities are right, but there aren’t the levels of investment to really achieve those priorities,” Berger said. Baker’s budget will now head to the House and Senate, both of which are expected to make significant changes. One area that could arouse passion in the Legislature: Baker’s proposal to eliminate earmarks for local projects. Often derided as pork, the projects are cherished by legislators. Joshua Miller can be reached at joshua.miller@globe.com. Michael Levenson can be reached at michael.levenson@globe.com.